Scientists at UC Berkeley are asking the public to help with a problem that’s been bugging them - their century-old insect collection needs to be digitized. 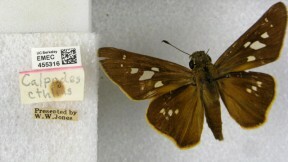 UC Berkeley’s Essig Museum of Entomology has been gathering insect specimens since the 1880s. With 10,000 drawers filled with bugs, no one’s exactly sure how many there are. 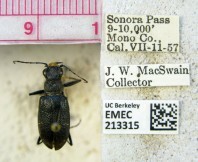 Most of those insects are preserved on pinheads, attached to small labels that say where and when they were collected. Those field notes hold a valuable record of California’s natural history, but the information has never been transcribed into a database. “We estimate it would take decades, if not a hundred years, for us to go one-by-one and enter the data from every specimen,” Oboyski says. That’s where the public comes in. Through a new online citizen science project called Calbug, the public can pitch in by reviewing photos of the specimens and transcribing the field notes online. UC Berkeley has uploaded almost 100,000 specimens, with several other institutions soon to join in, like the California Academy of Sciences, UC Davis, San Diego Natural History Museum and the Los Angeles County Museum. “If this project works well for our museum, then it can be adapted for all the other collections across the country and even across the world, because there are millions of specimens out there waiting to be transcribed,” says Oboyski. Collections like this will become particularly valuable as scientists track how wildlife and plants shift with a changing climate. Insects are a crucial part of preserving biodiversity, Oboyski says. “There are more species of ants in the world than there are of birds, and that’s just one family of insects."